This fall and winter, as I've been learning to eat locally and seasonally, I have been working on a bunch of ways to use pumpkin and winter squash. 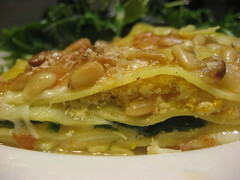 I have been developing this pumpkin lasagna recipe for a while. It's too soupy if you use already cooked lasagna noodles, but it works well with no-boil noodles. The recipe isn't perfect yet, but it is good enough to share! Chop your onion pretty finely, and put olive oil in a (preferably non-stick) saucepan at med-high. When the oil is hot, add the onion. Cook five minutes, stirring regularly, and reduce the heat to low. Stir occasionally until onion is soft and has started to caramelize–or until whenever the rest of your meal is ready to put together. Mix together in a large bowl the ingredients from pumpkin to pepper, using only half of the Parmesan. Stir in your sauteed onions. Spray a 9×13 pan with cooking spray. Put a little of the pumpkin mixture in the bottom and spread it around. Bake 40-45 minutes–until lasagna is bubbling well and cheese on top is melted and beginning to brown. We served the lasagna with some red Russian kale, which I chopped (removing the stems) and steamed with garlic and herbs. One of our dinner guests said that the slightly bitter kale was the perfect accompaniment to the slightly sweet lasagna. Delicious! I think next time I'll add roasted garlic and some cayenne for a little kick. I've been harvesting a ton of butternut squash out of the garden this year and I think this is a great idea for some of it. I'll let you know how it comes out. Thanks for the inspiration!